DYNAMED database – a medical database that is deemed “better” than the wellknown uptodate database. Recently reviewed in a BMJ article to be the most current database of the following 5 databases – Clinical Evidence, EBMGuidelines, eMedicine, Dynamed, UpToDate. Dynamed can be downloaded and used offline on smartphones / laptops / Ipads. 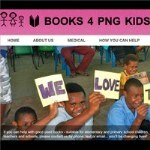 Brisbane based nurse Ibi Patane has worked extensively to get FREE access to this resource for all doctors working in PNG. Email Ibi Patane <i.patane@qut.edu.au> to get your free username and password to be used by doctors working in PNG only. HINARI portal from WHO – the HINARI Programme set up by WHO together with major publishers, enables developing countries to gain access to one of the world’s largest collections of biomedical and health literature. Up to 11,400 journals (in 30 different languages), up to 18,500 e-books, up to 70 other information resources are now available to health institutions in more than 100 countries, areas and territories benefiting many thousands of health workers and researchers, and in turn, contributing to improve world health. Papua New Guinea has been approved for free access, however you need an organisational IP address in PNG to have access…. in development. 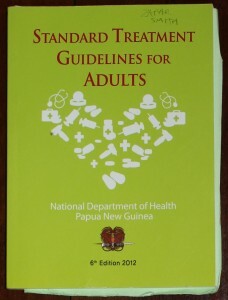 Adult Standard Treatment Guidelines Booklet 2012 – published by the PNG Health Department and WHO, this book is indispensable when working in PNG healthcare. It gives detailed treatment summaries, particularly antibiotic regimes that are specific to the microbiological flora of PNG. Copies can be collected from Pharmacist and Store Coordinator Winmary Bariamu at Port Moresby General Hospital, OR from the Department of Health Administration on Level 2, Aopi Centre, Waigani, Port Moresby. 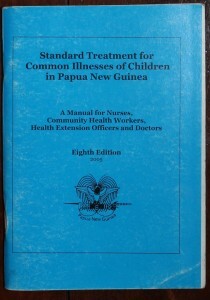 Paediatric Standard Treatment Guidelines Booklet 2005 – published by the PNG health Department, this book outlines the management of all the common illnesses that children of PNG suffer from. Copies can be collected from Pharmacist and Store Coordinator Winmary Bariamu at Port Moresby General Hospital, OR from the Department of Health Administration on Level 2, Aopi Centre, Waigani, Port Moresby. 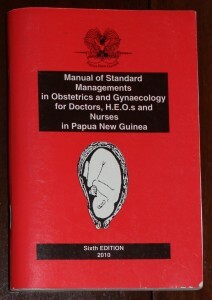 Obstetric & Gynaecology Treatment Guidelines Booklet 2010 – Written by Professor Glen Mola and published by the PNG Health Department, this book outlines the managment of O & G problems in PNG. Copies can be collected from Pharmacist and Store Coordinator Winmary Bariamu at Port Moresby General Hospital, OR from the Department of Health Administration on Level 2, Aopi Centre, Waigani, Port Moresby. 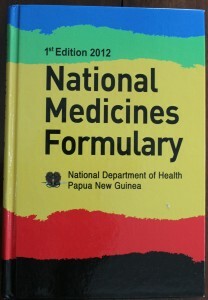 National Medicines Formulary PNG 2012 – published by the Department of Health PNG, this book lists all the medications that are licensed for use in PNG. Comparable to “MIMS” used in Australasia, this book outlines doses and methods of administration of all medications used in PNG. Copies can be collected from Pharmacist and Store Coordinator Winmary Bariamu at Port Moresby General Hospital, OR from the Department of Health Administration on Level 2, Aopi Centre, Waigani, Port Moresby. Orientation Book for Doctors visiting Port Moresby Emergency Department…. in development. Guide to Working Abroad – published in Medical Journal of Australia 2011, this document outlines key issues to plan for when going overseas to do work as a junior doctor or medical student.